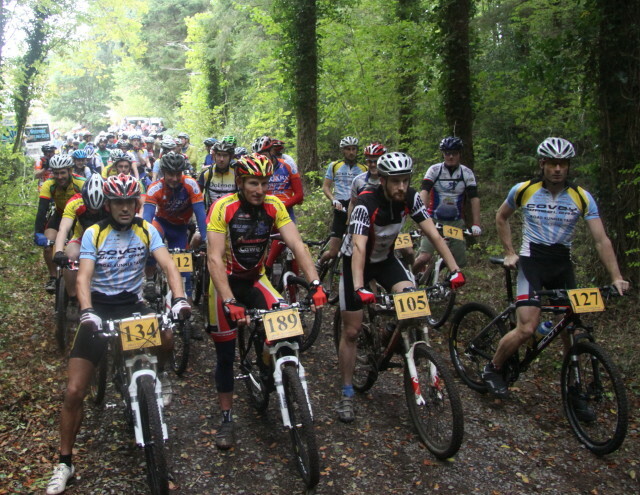 The biggest ever field seen in Connacht for a mountain bike event turned up at Cong for the Connacht MTB champs last Sunday, 69 brave souls wanted to try themselves against the challenges of Mountain Biking and see how they could handle their fat tire machines. The border village between Galway and Mayo was ideally located and suited everyone, the course was fast and in places technical and held up great with very little muck to be seen on the bikes after. Anthony Testa West Coast Wheelers Galway who is having a great end of season where he clocked the fastest time at the Connacht Hill Climb Championships only 2 weeks ago now added another Gold to his collect in the MTB Champs, the former pro French cyclist had clear day light over Michael Flanagan Tuam, who was unlucky to puncture and had to run the last km, but there was no disputing the winner as he made his move at the start of lap 5 of 5kms course. Colm Staunton Westport put in an impressive performance to grab 3rd. This race was also the first round of the Connacht MTB league, the next round will be in the brother of arms grounds in Clairnbridge on October 24th, sign open at 10am racing at 11am.